A major user complaint when it comes to Microsoft Internet Explorer's functionality in general is the lack of a built-in spell checker to automatically correct spelling mistakes in the browser. That's even more problematic if those users are working with browsers like Firefox as well which come with a built-in spell checker. It is not clear why Microsoft has not added a spell checker to Internet Explorer, but the lack of the feature for such a long time suggests that it is not very high on the company's priority list, if at all. Third party tools come to the rescue. 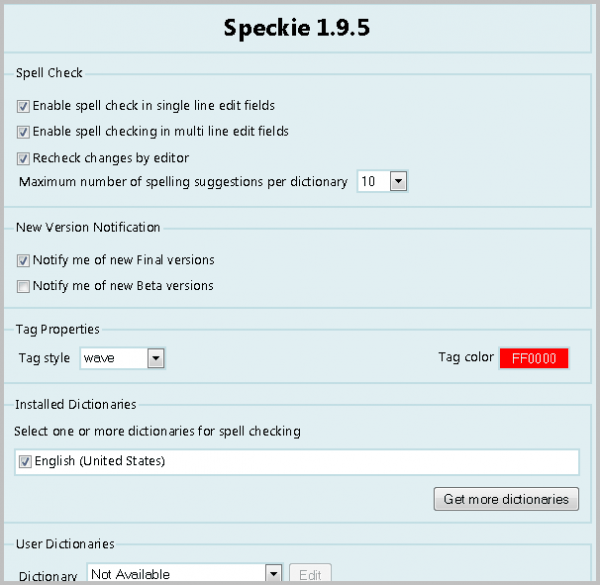 One of the most popular spell checkers for Internet Explorer is SpeckIE. The add-on is compatible with all recent versions of the web browser including Internet Explorer 9. Like other Internet Explorer add-ons it comes as a standalone executable. Just download the program and follow the setup to add the add-on to Internet Explorer. You are asked to confirm that you want to add SpeckIE to Internet Explorer on first run after installation of the spell checker. Make sure you accept the inclusion. I had to close Internet Explorer afterwards and start the browser anew to get the spell checker to working. The spell checker works after that on its own with no option to configure it further. You can access SpeckIE's options via the Tools menu of Internet Explorer or by entering about:Speckie in the Internet Explorer address bar after installation and activation. Here it is possible to include or exclude installed dictionaries and user dictionaries, turn off the spell checking for single line edit fields and to limit the number of spelling suggestions per dictionary. It is furthermore possible to change the tag style and color of spelling mistakes. The default is a red dotted wave line that's displayed whenever words cannot be properly identified by the dictionary. This can be because you have misspelled the word or because it is not in the add-on's dictionary. SpeckIE comes as a 32-bit and 64-bit edition for 32-bit and 64-bit editions of Microsoft Internet Explorer. It ships with an English dictionary file by default. Other dictionaries are available on the developer website. These additional dictionaries can be installed with a double-click after downloading them. I suggest you download the spell checker from a software portal like Softpedia, as you need to register an account at the developer website before you can download it from there. Would be nice if they would have such an add on for Firefox, as it’s way more popular that Internet Exploder, any day! The one Spell Checker, namely After the Deadline doesn’t work any more and is totally useless with FF 4 and 5 Beta 2!! It kept telling me that it can’t access the ‘Net, which didn’t make any sense at all!! Other users posted comments in the Forum concerning the same issues and other bugs, so I dumped it until it gets fixed! 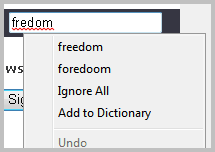 Firefox has a built in Spell checker which seems to work fine!